Extremely small size and light weight offers complete portability in field use. A charge amplifier Input is incorporated to enable far-point vibration measurements, eliminating influences originated in length of input cable. No range selection is needed for acceleration measurement up to 200m/s2, for velocity measurement up to 200mm/s(RMS) and for displacement measurement up to 2 mm p-p.
A hold-function is provided for digital readout holding which insures easy reading. A commercially-available transistor-use dry battery is used as the power source for complete portability. And the battery alarm system is incorporated for battery check. Piezo Electric Pickup is used as the input transducer for long life operation and wide frequency range of 10 to 5.000 Hz. Full accessories of a contact pin, a handler and a magnetic holder are provided as standard for various field use. 5. Output Cable 1m -1- pc. Magnetic Holder -1- PC 8. Instruction Manual -1- vol. Acceleration 10 mV/(m/s2), 2 V max. Velocity 10 mV/(mm/s), 2 V max. Displacement 2 V/mm, 2 V max. 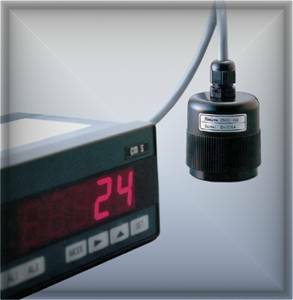 Digital Indicator Liquid Crystal Display 3-1/2 digit Sampling rate approx. 3 times/sec. Readout Holding During depressing the HOLD button the readout can be held. High accurately detecting for vibration amplitude, small size and light weight. Three types; measurements for displacement, velocity and acceleration. As output is 4 to 20 mA, it is possible to connect to Recorder, Indicator and Sequential circuit directly. Small size! Light weight! Low price! All in one type for Sensor, Amplifier and Transmitter. Simple: connection with only two lines. For Simple Vibration Monitoring System with low cost. As for assembling into the Driving motors, Blowers, Pumps and the other various rotating machines. As the Vibration sensor in the Automatic inspection system. As for the simple type vibration meter. As for equipment diagnosis of the machine tools and other various manufacturing plants.